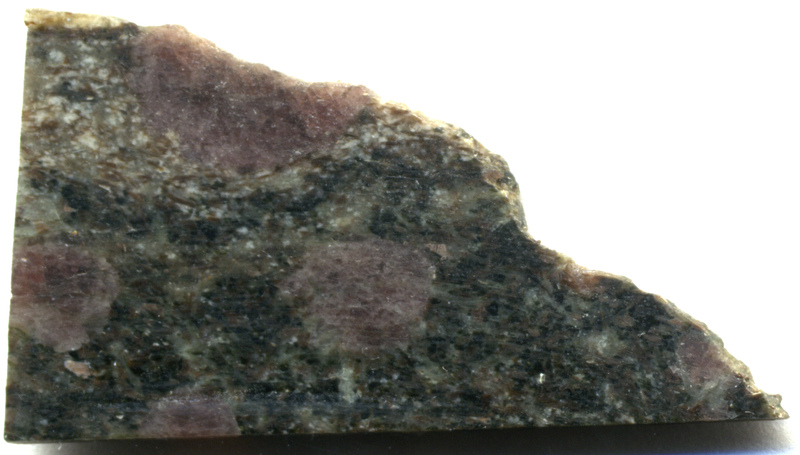 The oldest rocks that still exist are formed. These can be found now in the Hudson Bay area in Canada. In the Universe, the anti-gravity of dark energy starts to dominate over the gravity of matter. The history of the Earth can by understood by dividing it to the different units of the geological time. This classification describes how the layers of rock and fossiles relate to the time and is based on rock strata and radiometric dating. The Earth is, however, a dynamical planet. Its crust is constantly renewing due to the plate tectonics. Therefore the history of the Earth has not been recorded in any uniform set of layers on the planet, but geologists have been compiling the long history of the Earth from the scattered pieces of strata for over the last 150 years. The history of the Earth has been divided into the different units of time: Eons, Eras, Periods, Epochs and Ages. The oldest history of the Earth is not well known, because most of the rocks from those periods have been destroyed by geological processes. After the appearance of the complex life about 635 million years ago, the changes in the biosphere have nearly completely define the geological time. Thus, the passing of time reflects the evolution of the life: Speciation, diversification, mass extinctions and many other events, which are not always fully understood. 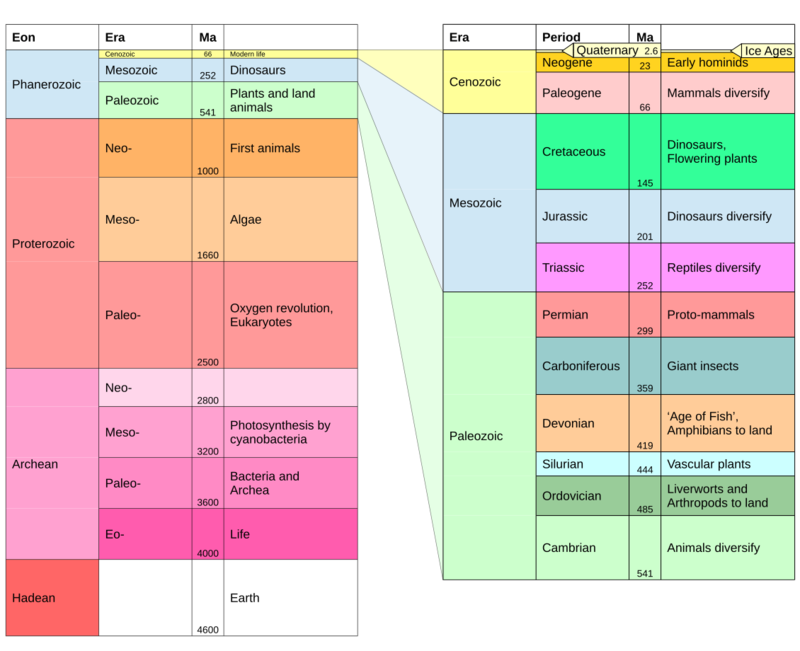 The names of the geological timescale may seem seem complex and difficult. Most of the periods, such as the Cambrian period, have been named after the places where the strata have been described. The International Union of Geological Sciences (IUGS) keeps up and updates the geological timescale and it becomes more and more accurate as more research is done. The geological time scale describes how the layers of rock relates to the time. 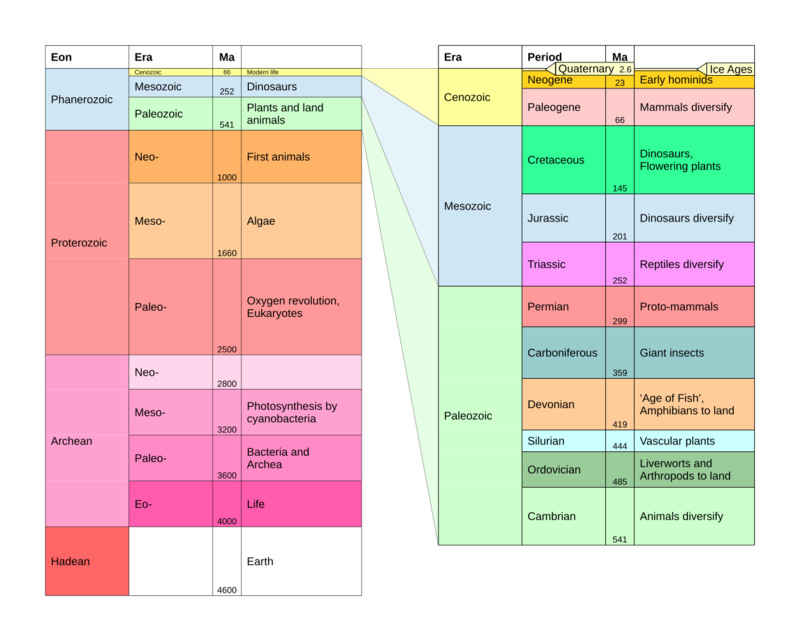 The time scale can be used to illustrate the history of Earth and biosphere. Image: Anni Kauko.